How Can I Go Bell Road Cycle Nutrition and Training? 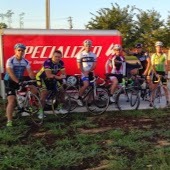 Where is Bell Road Cycle Nutrition and Training in Montgomery on the Map? This location has 9 reviews from customers. I bought a Stages Power meter from Bell Road Cycle. The unit works perfectly. Chad has called me and texted me a number of times about the unit. He has been most helpful in developing a training plan based on power. I couldn't be happier with my purchase. Thanks guys! I have been blessed being able to open a bike shop and then getting Jon Deweese a former 10 year head mechanic and shop manager from a Specialized Concept store. Watching Jon wrench on a bike is something else and it just makes me smile and it is fun learning from the best. Then to get a cycling enthusiast Darren Boulware to run the store and with his love of cycling and wonderful attitude and loves people and has worked at a bike shop in California. With both of our passion to ride and be around bikes and help people grow in the sport we love as this is not a business this is a real bike shop all for fun and when that is gone the bike shop will be gone. So please come visit and lets get cycling. As a new resident of Montgomery, I've lived in DC for the past several years and maintained relationships with a wide variety of high end bike shops. I can confirm that chad and his staff demonstrate superb expertise, customer service, and professionalism. They operate an above board business and will make sure you have the right bike and equipment, and not just the most expensive set on the market. Further, this is also a very pro- military shop and tailors his customer service for each individual client. I give this shop my most enthusiastic recommendation. My only complaint, BRC is not in Prattville, but my experience with BRC and associates has been very positive, which is all the more remarkable considering my demanding expectations. Very nice and knowledgable staff. Highly recommend !